If you’re experiencing sharp pains in the heels of your feet in the mornings, which tend to dissipate but return later in the day, chances are you’ve got plantar fasciitis. Also known as a policeman’s heel, this condition occurs when the band of tissue running from the heel bone to our toes experiences strain or pressure, becoming swollen or irritated and unable to provide our arches the appropriate support. Common amongst athletes, middle-aged individuals or anyone else who finds themselves on their feet a lot throughout the day, most podiatrists will likely start you off with getting the proper arch support for your feet, to alleviate or avoid the pain. But what footwear do you pick? We’ve put together our list of the best sandals you can give a go for plantar fasciitis. Fashioned out of EVA (ethylene vinyl acetate), a highly elastic but hard-wearing material which resists cracks and extreme temperatures but is nonetheless soft and comfortable to have on, these sandals are designed to naturally fit the shape of your soles to give you maximum arch support. The EVA construction cushions the feet when worn, and absorbs all those unpleasant shocks which might otherwise trigger sharp pains in your heels. Effects of over-pronation or supination are negated by the deep heel cups of these sandals, which support the feet to encourage a balanced, stable gait to alleviate pain and aid recovery. With a unisex design suited to everyone, Footminders offers these sandals in the appropriate sizes for both men and women. Though these sandals do not come in half-sizes, the available options are true to size and offer perfect, comfortable fits to keep your feet happy throughout the day. A brand created by podiatrists themselves to offer the optimum orthotics to help those suffering from flat feet or low arches, you’ll experience a marked difference in recovery with a pair of these on. 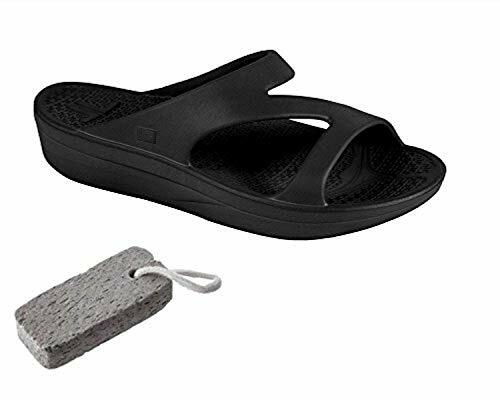 Inspired by the traditional Japanese zori, these ‘sport’ variations of classic thong sandals are synthetic, lightweight, quick to dry and easy to slip on and wear throughout the day. The rubber sole offers the perfect grip to keep you from slipping across smooth friction-less surfaces, while the insole comes with padded straps and high arch support to prevent excessive pronation – often attributed as a main cause of plantar fasciitis. With a classic design suited to both men and women, a one-inch heel and a half-inch platform, these shoes can help you maintain proper posture as you go about your daily chores or hop down the street to the convenience store, all the while helping you recover from plantar fasciitis. If you’re looking for more colorful, vibrant options, this might be what you’re looking for. Available in ten colors – from neutral black to fruity shades like ‘Fresh Cranberry’ and ‘Key Lime’ – these sandals are made of patented Novalon, lauded for its extreme rebound and shock absorption properties. With a ton of endorsements from athletes to podiatrists as great recovery shoes to ease the pain of policeman’s heels, the sandals come with an ergonomically contoured insole which naturally molds to, cradles and supports the curves of your feet while offering the ideal arch support. 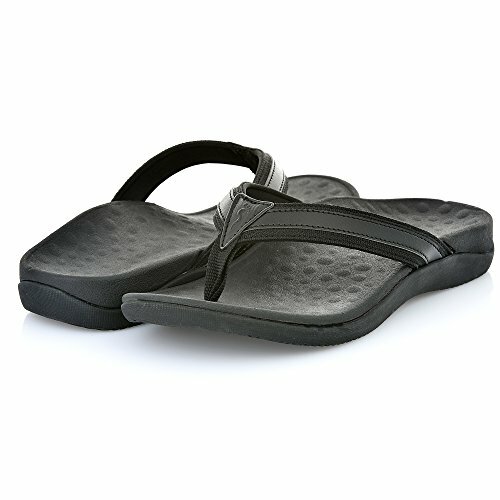 Comfortable and lightweight, these shoes are specifically recommended by doctors to treat plantar fasciitis, but have also been voted Best Comfort Shoe by NY Times Readers Choice, with innumerable gushing user testimonials to assuage any doubts you may have about how great these sandals are to deal with those annoying aches and pains. 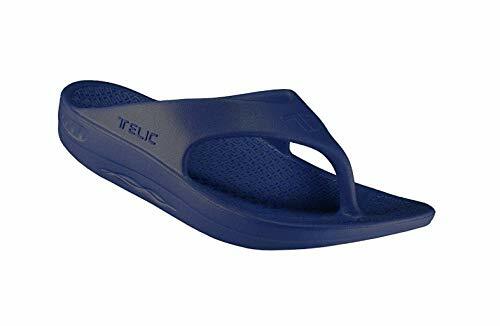 If you’re looking for all the functionality of a Telic Arch Support Sandal, but aren’t fond of the thong style, why not look at exactly the same option but with a Z-strap instead? Available in six colors, from neutral espresso brown to a bright hot pink, these comfy sandals bear all the same characteristics that have made Telic podiatrists’ go-to brand when recommending sandals for plantar fasciitis patients. With a slight negative heel, ergonomically shaped footbed, and the highly durable, water- and wear-resistant Novalon material which gradually softens and morphs to suit the shape of your feet, it’s hardly surprising that this brand’s options feature twice on this list. With shooting pain biting up your heels the minute you set your feet down in the mornings, restrictive shoes which might end up crushing your toes or pressuring your heels are the last thing you’d want. Sandals are a more attractive option – but even the ergonomic build of the sandal factors into how good or bad a pair is if you’re suffering plantar fasciitis. The first thing to look for is, of course, arch support. While there is the option of getting custom shoes or insoles made to suit the specific shape and contours of your feet, there are several great options out there built to naturally hug the curves of your feet and offer the needed support. Look out for options with form-fitting insoles and footbeds, which offer intrinsic arch support as well as cushion your foot comfortably, so you can wear them all day long. The ideal shoes will hold up your fascia ligament, that stretch of tissue which protects your arch – a quick-fix solution to those of us who have flat feet. Materials such as Telic’s signature Novalon or the elastic, soft polymer EVA are both ideal for long-wear and durability due to their water- and strain-resistant qualities, as well as their comfortable-to-wear construct that lets you have them on without chafing your skin. Shoes which are built-in with shock absorption are also highly recommended – bumps and shocks from improperly stabilized shoes can exacerbate the pain of plantar fasciitis. The best orthopedic shoes provide in-built motion control to help guide your gait and avoid excessive pronation (overly rolling the foot inward and leading to flat feet) or supination (the outward roll of the foot), thus preventing undue stress on the fascia ligament. Often a great way to narrow down the best shoes for plantar fasciitis is to check out which are recommended by podiatrists, chiropractors and other specialists themselves. Options endorsed by medical practitioners are more likely to have a legitimate reputation in reducing heel pain, compared to generic orthopedic shoes or insoles offering heel support.